The definition of a rabbit is a small, long eared, stubby tailed mammal with soft fur that bounces and burrows. An example of a rabbit is the Warner Bros. character Bugs Bunny and the Disney character Thumper. "rabbit." YourDictionary, n.d. Web. 17 April 2019. 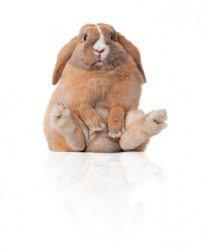 <https://www.yourdictionary.com/RABBIT>. Any of various long-eared, short-tailed, burrowing mammals of the family Leporidae, such as the commonly domesticated species Oryctolagus cuniculus, native to Europe and widely introduced elsewhere, or the cottontail of the Americas. The flesh of a rabbit, used as food. From Middle English rabet, from Middle French dialect (compare French dialect rabbotte, rabouillet (“baby rabbit")), from Walloon robÃ¨te, diminutive of Middle Dutch robbe (“rabbit; seal") (compare Dutch rob (“rabbit"), rob (“seal")), from Middle Low German robbe (“seal") (compare dialectal Low German Rubb, Robb, German Robbe (“seal")), from rubben (“ro rub"). More at rub. (UK, intransitive) To talk incessantly and in a childish manner; to babble annoyingly. For the rabbit, it was a bad day. An Antillean rabbit is very abundant. The rabbit tired of her inquisition and hopped away a few steps. Nor does the flesh of the Belgian rabbit resemble that of the hare in colour or flavour. With figures of the ancient moon-god, the twelve months, and the rabbit as the animal moon - emblem.